How Mango, the King of Fruits, Can Help Farmers with Riches! Primarily considered as an agricultural country, India has largely been focused on production of grains, and vegetables. And, while there have been some cash crops, their scope and opportunity has not been thoroughly explored. For instance, India’s farmers may not have realised the potential of fruits to bring in revenue, beyond the market for domestic consumption. Let’s take the example of mango –our very own king of fruits. India is the largest producer of mango in the world, but at the same time, globally, Mexico is the largest exporter of the fruit, accounting for 20 per cent of world mango exports (as recorded in 2014). It is important to note that the demand for mangoes is growing across the world, especially in markets such as the United States, Canada, the European Union, and China, and India can play a great role in fulfilling the demand. While exports are in focus in India as well, the proof is in the numbers where mango exports have reduced from 63,440 tonnes in 2011-12 to 55,585 tonnes in 2012-13–a year-on-year reduction of 12 per cent. This is neither good news for producers or consumers, and definitely not for companies that rely heavily on sourcing of fruits for production of drinks. For instance, more than 4 lakh metric tonnes of mango pulp is used to manufacture Maaza. But then it’s not that there are fewer mango plantations. The problem is more operational, and structural. In India, the practice of growing fruit has been very traditional, with the use of old techniques, resulting in lower yields. A sorry figure is that the per hectare yield in India stands at 6 tonnes per hectare. New age agricultural technology is a good way to ensure that outputs increase per acre, hence help a farmer with smaller sized farms, which are commonplace in India. One of the ways that Coca-Cola is strongly advocating is Ultra High Density Plantation (UHDP), wherein various steps, and techniques that are used to improve growing methods, and improve productivity on one hand, and conserve water and land resources, on the other. A general notion for a farmer would be that bigger trees, with wide spaces between them would bear more fruits. Under UHDP it is advocated that the trees are planted much closer to each other (about 3x2 meters apart), along with the use of drip irrigation, and regular pruning of the trees in the orchard. With this process, farmers are not only able to take up the plant density to as much as 1,666/hectare, but also reduce the consumption of water by more than half, and more importantly this would result in doubling the production per hectare as well. Not only this. The duration within which the plants bear fruits come down from 8 years, to about 3 to 5 years, which means that the farmers start earning much ahead of time, and double the income as well. 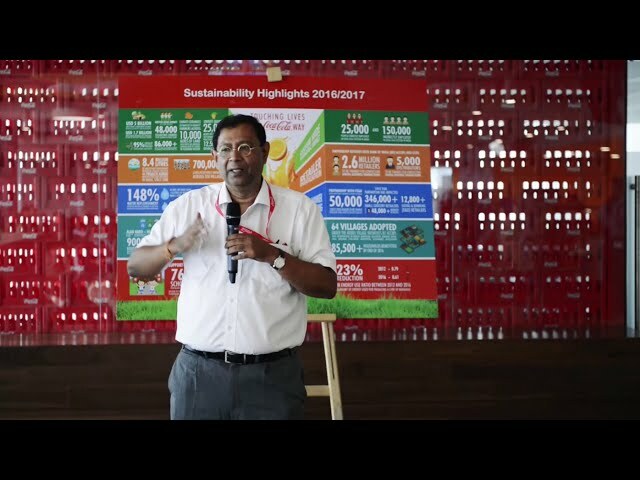 Coca-Cola’s Parivartan initiative is trying to make producers aware of these new age methods such as UHDP, but also ensure that there is sustainable improvement in their lives with increase incomes, which in turn can also benefit the organisation. Under the programme, Coca-Cola India is attempting to train close to one lakh retailers across more than 1,700 towns. And, for farmers, Parivartan uses a combination of practical training on the farms, classroom trainings, and model farm visits, with a target of reaching out to more than 50,000 farmers in the next five years.